Friday morning, Commission on Elections announced the list of Proclaimed Party-List in the recently concluded midterm polls. Thirty eight out of 58 party-list seats awarded to the following group listed below. National Board of Canvassers (NBOC) Resolution 0006-13 said, "The Comelec, sitting as NBOC, resolves to partially proclaim the 38 party-list groups as initial winners in the party-list elections of May 13, 2013, entitled to one guaranteed seat." However, the guidelines provide that winning party-list groups cannot have more than three seats. The Philippine constitution mandates that sectoral representatives shall compose 20% of the House of Representatives. For the meantime, If you feel that this details are informative, please bookmark it now or visit this site more often for you to be updated. 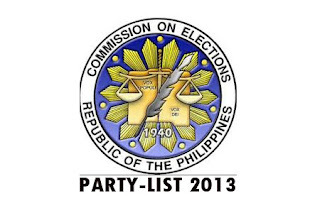 You may also share this post to your friends so they may know about the COMELEC List of Proclaimed Party-List 2013. Comments or suggestions about "COMELEC List of Proclaimed Party-List 2013" is important to us, you may share it by using the comment box below.